Today we met someone who surely is one of the world’s best kept secrets. Prof. Wu Qing is simply one ofthe most amazing people I have ever encountered. Meeting her brought to mind a line from a Du Fu poem which reads, “There is a beauty of the ages, who lives obscured in an empty valley.” Now Wu Qing does not live in an empty valley, but she is a “beauty of the ages” who deserves to be more well-known than she is in the U.S.
At age 70, Wu Qing is a bundle of energy, belief, commitment, and passion for helping others. 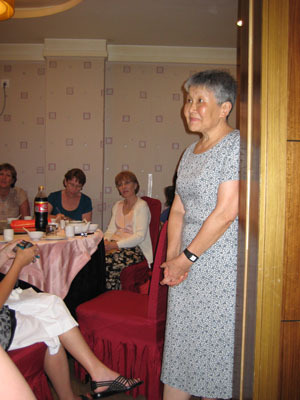 The daughter of the famous writer Xie Bingxin, she has survived the trials of the Cultural Revolution and emerged as a noted scholar and activist, particularly on behalf of rural and migrant women in China. In 2001 she received the Magsaysay Prize (the “Nobel Prize” of Asia) and is the deputy-director of the Beijing People’s Congress. She has traveled all over the world speaking out about many causes and has received many other awards and recognitions. Our whole group was simply blown away by her and her honesty, intelligence, and eloquence. This will be a highlight of the trip! Here is a picture of Wu Qing. is committed to issues of justice I feel a kinship with her. I would like to find the book of poetry that you are quoting. You are in our thoughts and prayers daily!